Within the ipv4 options field there are actually 3 fields: Copy, Option class, and number. Used to tell the routers about some routers this packet should traverse but does not have to. This command causes routers to record a timestamp of when the packet arrived in the header and send it back to us. 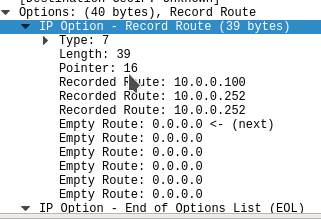 This options records all the paths that the packet took to get to the destination. These seem to be recorded/written by the routers on the path, here’s an example. Used for specify the IP address of a router that this packet traverses, such that the router can act upon it if configured to do so. This option is for defining a security class, it was meant for the military to tag their super top secret packets with this option. I’ve never actually seen this used in a military application yet. Again when using IP options the header increases from the default of 20 Bytes to something larger, it can be up to 40 bytes. If you install nmap, it should come with nping, which can ping with IP options so you can verify these details. sudo nping -icmp -c 1 -icmp-type 8 –ip-options “\x94\x04\x00\x00” –dest-ip x.x.x.x. Here’s a test I did with some IP options, notice now the internet header length is 24 bytes, which is 4 more than normal. Here’s a normal IP packet with no options, with a header of 20 bytes. Recall that in section 1.1.d Explain IP Operations, we heavily looked into the IPv6 header. In there we saw a next header field. This field is used to either tell us about the next upper layer protocol (common) or to tell us the next IPv6 extension header. At the end of all of the extension header packets, we will have an IP packet denoting the next header as being an upper layer protocol. Hop by Hop: Used for Ipv6 Multicast Listener Discover (MLD). Destination: Is used to denote other destinations Cisco claims this is for “IPv6 Mobility”. Routing: Similar to source routing. Fragmentation: Denoting IPv6 fragments done by the source host. ESP: Similar to the IPv4 ESP header and functions. Routers that see IPv6 packets with extension headers are only required to process the Hop by Hop header and the others are optional or intended for the source or destination. note that the hop by hop extension header cannot be CEF processed and must be sent to the punt adjacency. Also, wireshark is your friend here, capture and review.